Jewish tradition teaches that bodies cannot be left alone. The community has come together to guard the victims of Saturday’s shooting. Jewish tradition teaches that the dead cannot be left alone. Some call it a sign of respect for people in death, as in life. Others say that the soul, or nefesh, is connected to the body until it is buried, or even for days afterward, and people must be present as it completes its transition into the next world. When one person dies, members of the Jewish community often step in to care for the body and the family. When 11 people die, the whole community becomes part of the mourning process. The logistics are complicated. Eleven bodies have to be accompanied, washed, and buried. Eleven funerals have to be planned. Families move into an intensive period of mourning, called shiva, that lasts for up to seven days after the burial. In many circles, the fathers, mothers, sisters, brothers, sons, and daughters of the dead will say a special prayer, the kaddish, in the year following the death. For them, and for the Pittsburgh Jewish community, the sense of loss will likely last far beyond that. As one rabbi said, now there will always be a time before the shooting, and a time after. Three different congregations were praying in the same building on Saturday when a man walked in carrying three Glock handguns and an AR-15 rifle and killed 11 people. Three people from New Light Congregation, which meets in the basement, died. Another, from Dor Hadash—which translates to “new generation”—was murdered as he was running to provide help. Seven were killed upstairs in the sanctuary of Tree of Life–Or L’Simcha, or “light of joy.” They were among just a handful of congregants who had come on time for services. In the chaos after the Pittsburgh shooting, an Orthodox rabbi, Daniel Wasserman, stepped in to oversee the care of the bodies. He coordinated with the FBI and the Allegheny County medical examiner to make sure that the investigation was handled with religious sensitivity: that it was fast, that the autopsies were minimal, that the community was able to maintain a presence throughout the process. Wasserman was there as the bodies were moved from Tree of Life to the medical examiner’s office, and he organized a spreadsheet for volunteer shomrim who would guard the bodies: One slot for every hour until an undetermined time, when the dead would finally be released for burial. By Sunday evening, all but two of those who were murdered had been sent to funeral homes. A little after 8 p.m., an officer came to check on whether people would be there throughout the night, since the last of the bodies were almost ready. Yes, answered the woman holding down the guard. Volunteers would be there all night. America has developed a mourning rhythm around mass shootings. The first reports hit Twitter, and then cable news. Stories, light on detail and long on familiar imagery like police trucks and do-not-cross tape, start to trickle out. Depending on the body count, the media descends, knocking on every victim’s family’s door and cornering every official. Vigils are held; protests might be planned. The news cycle devolves: another fight over gun control or thoughts and prayers or an insensitive thing an elected official said. The country moves on. Repeat. Repeat. Repeat. It is day three of the after for Pittsburgh, but the mourning in the Jewish community has only just begun. It is Jewish tradition to bury bodies as quickly as possible, often within 24 or 48 hours. With a complicated crime scene and an investigation into a mass murder, that has not been possible here. The funeral dates are slowly being announced: On Tuesday, Cecil and David Rosenthal, the mentally handicapped brothers who both died at Tree of Life. On Wednesday, Mel Wax, the hard-of-hearing stalwart at New Light Congregation; Joyce Fienberg, a 75-year-old researcher at the University of Pittsburgh; Irving Younger, a fixture at Tree of Life. They will stretch on into the week. But a structure of ritual is there. “We, the Jews, are good at death,” says Rabbi Seth Adelson, whose synagogue, Beth Shalom, is less than a mile from Tree of Life. “The customs that we fulfill at this time are really helpful for those who have suffered a loss.” In the face of extraordinary tragedy—the deadliest attack on Jews in American history, according to the Anti-Defamation League—ordinary rituals help Jews grieve. Since Saturday, members of the community here have been finding every possible way to gather. Students at Taylor Allderdice High School organized a candlelight vigil to mark the shooting and the transition from Shabbat, the Jewish Sabbath, into the first new week of a new reality. The next day, people gathered by the Holocaust sculpture on the campus of the nearby Community Day School to speak and cry together. 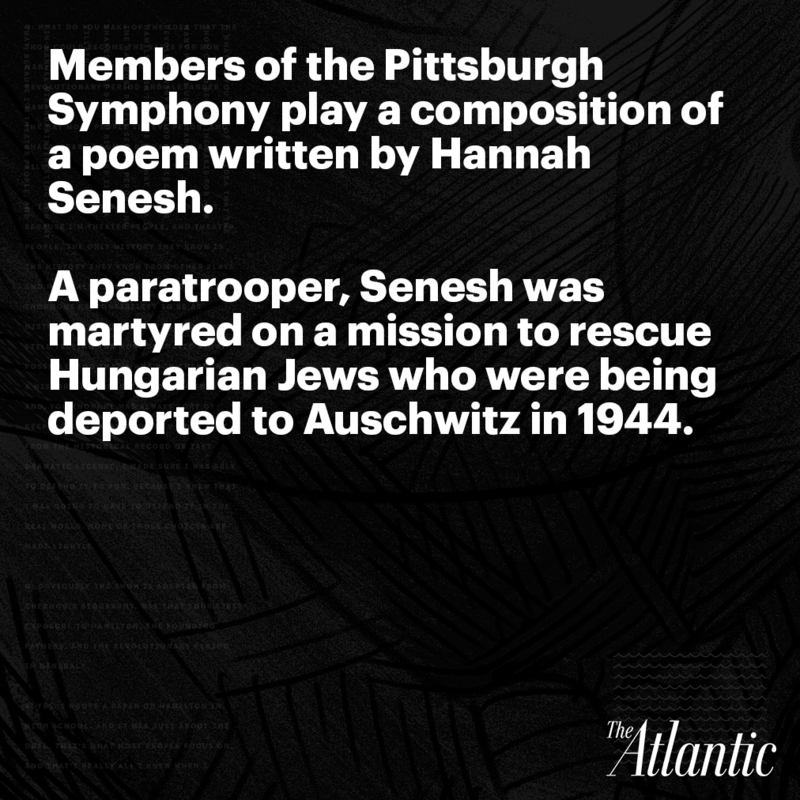 That night, thousands of Pittsburghers showed up at Soldiers and Sailors Memorial Hall for a vigil, attended and led by top Pennsylvania officials, members of the Israeli government, and the community’s Jewish leadership. At each of these events, people have shared an impulse to testify: naming a brother’s friend, who lost his mother; explaining that they had skipped synagogue that Saturday to see family or sleep in, thus missing the shooting; sharing random memories of each person who died, and how absolutely vital he or she was to the congregation. Beth Kissileff is married to the rabbi at New Light Congregation, Jonathan Perlman, and had been planning to go a little late on Saturday morning. She and her daughter both spoke at the vigil by the school Holocaust sculpture on Sunday. She was determined that the story of her community, including the three who were lost, should be about life, not death. Dan Stein, she said, commemorated his bar mitzvah every year by reading his Haftorah portion, the passages of the Bible he had been assigned to learn at 13 to mark his entrance into Jewish adulthood. That tradition went on for many years: He was 71 when he died on Saturday. When Kissileff’s daughter reached bat-mitzvah age, he took her to buy a gift to celebrate her own coming-of-age. His grandson was born only seven months ago. And then Rich Gottfried, the 65-year-old dentist who had wanted to get more involved with the synagogue when he retired. He came to services even after he broke both knees falling on his driveway last winter. He stood and read Haftorah for the synagogue, even in his brace. “A person of determination,” Kissileff said. These memories are similar to ones that have been passed around all over Pittsburgh for the past two days, little talismans of life against the gruesome nature of these deaths. All of the victims were over 50, and most were over 65: They were the old folks who show up to synagogue on time, the steadfast members of their congregations. All the rest—Joyce Fienberg, Rose Mallinger, Jerry Rabinowitz, Cecil and David Rosenthal, Bernice and Sylvan Simon, and Irving Younger—have stories too. “The gory details are not what people need to know,” Kissileff told me. “I want people to know who these people were, and what they stood for. That they were passionate about Judaism, and about the shul,” or synagogue. After the shooting, Kissileff and her husband and daughter went to the Jewish Community Center to meet with families of the victims. They learned that the bodies were still inside the synagogue; later, Wasserman told me that they were transferred in the early hours of Sunday morning, between 1 and 5 a.m. Kissileff took comfort in knowing that a group of Jews was on-site, watching over the bodies. “It’s awful for me to think of [them] lying there alone,” she said. She took a deep breath, and slowly let it out. Each hour, when the shomrim changed shifts in the Pittsburgh morgue, they greeted one another with a round of questions about family, neighborhoods, and synagogues. It was a sign of Pittsburgh’s trademark friendliness and a natural exchange for this tight-knit Jewish community: Everyone knows everyone here. But there’s also a question implicit in the searching introductions. Vulnerable rituals rely on networks of trust, and this community was hit at the time when it is most exposed: during prayer. Traditionally, shomrim sit in the room with the body they are guarding. At the morgue, this was not possible, so they stayed in a small room off to one side of the lobby, designated for grief counseling. The room was furnished with a dark, stiff couch and chair; it was the size of a small foyer, or a spacious walk-in closet. They read the psalms in order, one after another, with each person making sure the next guard knew where the readings had left off. Everyone had a different way of praying. One man stood facing the wall and rocked slowly from one foot back to the other. Another woman paced as she read, whispering the Hebrew words under her breath. A young couple came in and sat catty-corner to each other; they split up the numbered verses, odds and evens, and occasionally checked in to see how far the other had gotten. Each person brought a prayer book, some as big as textbooks, others the size of pocket dictionaries. Outside of occasional logistical discussions or buzzes of a cellphone, the room was quiet. Some sort of machinery—maybe the lights or the heating system—whirred in the background. Every once in a while, a door opened and slammed. Over the course of three hours, officers came in several times to check whether the guards needed water or help with anything. They brought updates on the bodies, asking someone to text the rabbi to make sure he knew what was happening. Wasserman said that the officials involved in this investigation have been very concerned about religious sensitivities. At one meeting, he hugged an officer in thanks. When the rabbi left the room, the officer began to cry. The brief conversations at the beginning and end of each shift at the morgue were warm: about how wonderful Pittsburgh is, how unified the community is here. The shomrim shook their heads at what had happened and marveled at the support flowing to Pittsburgh, especially the pictures and videos sent from Israel. They talked about the rare unity across denominations in this Jewish community; most of the volunteers appeared to be Orthodox, but they felt strong solidarity with the liberal communities that were directly affected by the shooting. They love their community, they said. Everyone is nice here. Everyone gets along. This was something they knew how to do. At least for an hour, whether in the afternoon or in the middle of the night, they did not have to sit at home and cry, or helplessly watch the country dissect their community’s loss on the news. The structure was there; the tradition told them what to do. Wait with the body until it can be buried. Pray over the murdered souls. You lay a table for me in view of my enemies, reads Psalm 23. You anoint my head with oil. My cup overflows. Here is what will happen next in Jewish ritual time. By 10 a.m. on Monday, roughly 48 hours after the shooting, all of the bodies had been released to funeral homes. Depending on families’ preferences, their loved ones will be carefully tended: nails cleaned, wounds washed, any remaining fluids cleared from the skin. Water will be poured over the bodies, in a process called tahara. They will be dressed in a plain linen or cotton set of garments, rather than fancy clothes, and wrapped in a simple sheet as they leave this world. Traditionally, Jews are buried in a casket made of wood, with no metal or embellishments. At the funeral, families might choose to walk with the deceased as they are taken to the grave site. “It’s a mitzvah of the highest order to bury our dead together,” Adelson told me. “Just as we welcome new babies into the community as a community, so too with death. We do it as a community.” People may tear their clothing, or a small strip of cloth: Tradition teaches that mourners are torn on the inside, and should be similarly torn without. After the funeral, the families of those who died may choose to observe shiva, a period of mourning when they will stay in their houses and grieve. Members of their community might visit, bearing food; tradition teaches that they should wait to speak to mourners until the mourners speak, to be attentive to the consolation each person needs. Mourners may choose to bathe only lightly or to not wash their clothes, or to sit on a low stool: These acts, Wasserman said, “show that we have been knocked down a peg.” People may cover the mirrors in their house or light a candle, out of respect for the soul of the person who died. In many communities, this begins a long period of saying kaddish, a special prayer that has come to represent mourning and honoring the dead. Often, only close family members take on this ritual of marking loss in prayer. 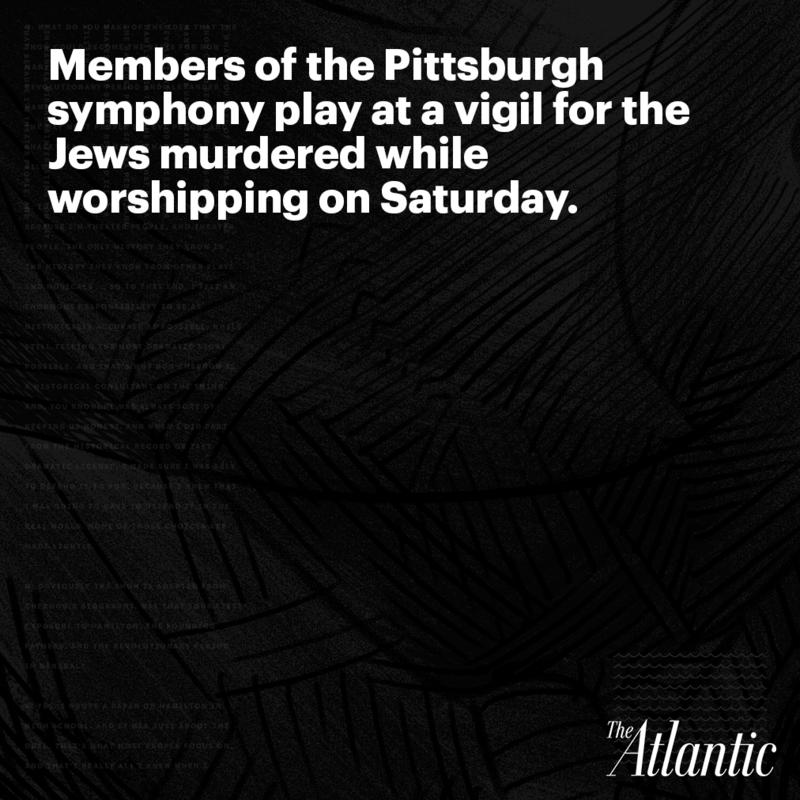 But in Pittsburgh, members of the Jewish community have been reciting kaddish collectively whenever they gather. It’s a way to process their enormous loss. This was the prayer that Pittsburgh recited together at the community vigil on Sunday night. They sang America’s national anthem, followed by Israel’s. The city’s clergy—Muslim, Catholic, Protestant, Jewish—came onstage and recited a psalm in unison. And the rabbis who survived the shootings declared that they would not be defeated by hatred. Am Yisrael chai, they said. The people of Israel live. Jeffrey Myers, the rabbi of Tree of Life–Or L’Simcha, stood on stage afterward, surrounded by people who wanted to hug or greet or cry with him. It was as though the whole community was rising up to be with him in this moment, to carry him along as he tries to care for his community. “I have seven funerals to plan,” he told me. “There’s not a specific plan. Everyone according to their need.” The rites, the songs, the prayers—they are there for him to reach for.